The FESIC organisation was created in 1969 by Norbert SÉGARD – renowned scientist and former Minister of Foreign Trade, Postal Services and Telecommunications in the 70’s who grew up in the North of France – alongside a group of directors of engineering “Grandes Ecoles”. As soon as it was created, FESIC members wanted to “underline FESIC’s originality by involving a real part of humanism in the course trainings and making a difference in the way courses were managed”. This is how the first network of higher education institutions saw the light in France. The federation is today formed by highly reputables and non profitables institutions with humanist traditions, which benefit from great development dynamics. It is a network united around the concepts of excellence, ethics and service of the society. Doctor in physics in 1953, he is appointed in 1954 tenured professor of the chair of physics in the Catholic Institute of Paris. 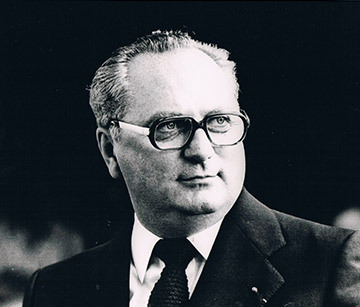 Elected deputy of the North of France in 1976, he was Secretary of State of Foreign Trade in 1974 and Secretary of State of French Post Office and Telecoms in 1976. In the 60s, Norbert SÉGARD took part in the creation of several schools such as ISEN. Ahead of his time, he believed that gathering them would enable these private catholics schools to gain in efficiency as well as in recognition by firms, the government, young people and their families. 11 of them were created at the end of the 19th century: HEI, ISAB, Icam, ESSEC, ESSCA, ESA, ESA Purpan, ICPI (nowadays CPE), EDHEC, ESTIT, ECAM. The 8 others were founded during the sixties : ISEP, ISEN, ESEO, ESCOM, ISA, IESEG, ISARA and IEFSI (now part of EDHEC). Icam and ISEN Lille opened schools in Nantes, Toulouse, Brest and Toulon. Engineering school Louis de Broglie, nowadays ECAM Rennes, is founded in Rennes. EPP, school of psychologists, joins the network. ECAM Strasbourg-Europe joins the FESIC network. The FESIC network brings together 5 Management schools, 19 engineering schools and 1 school of human and social sciences. The federation welcomes Kedge Business School.